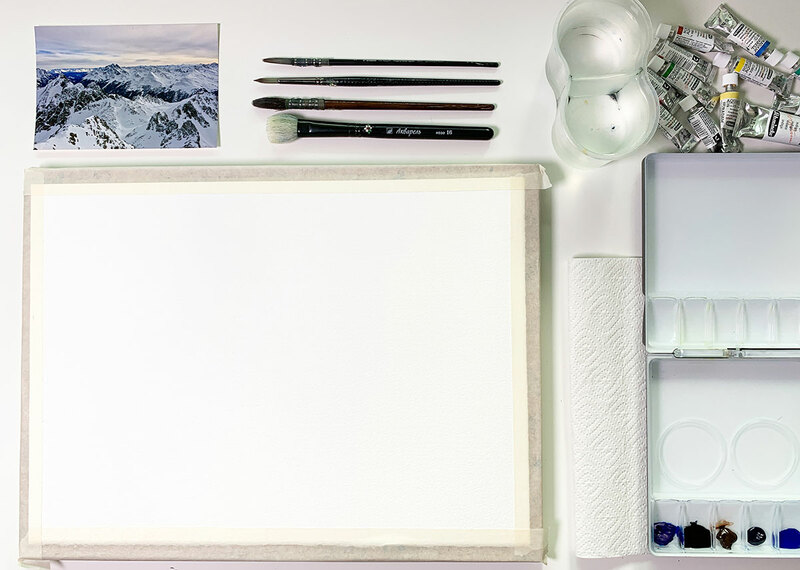 Like many artists Anna Zadorozhnaya is inspired by nature, but she is particularly motivated to paint by mountain scenery. 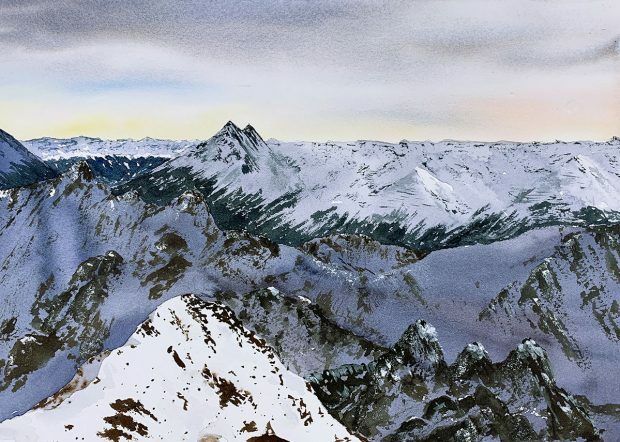 Anna has an MA in Art from Oxford Brookes University and is a member of the International Federation of Aquarellists. She has been painting in watercolour for just four years and already teaches the medium. She has a popular Instagram site called Draw Better where she shares images of her beautiful watercolour landscapes and writes interesting text to accompany them – in both English and Russian! 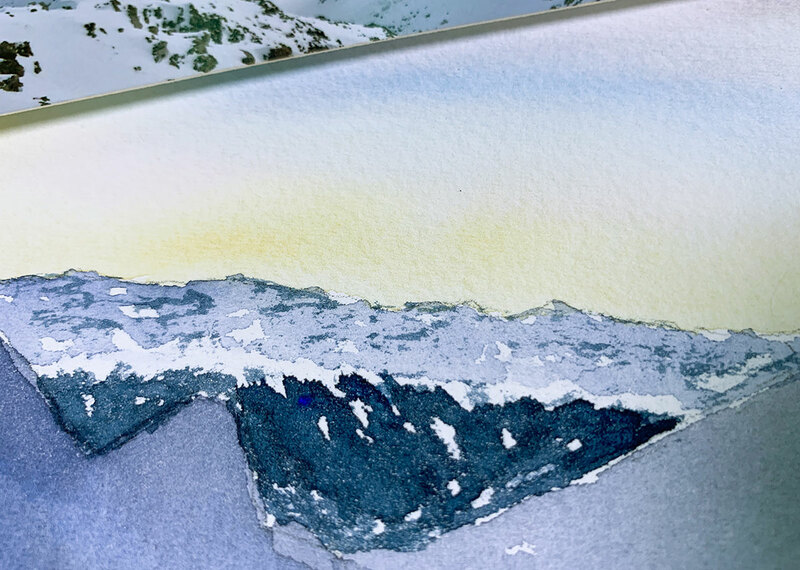 Anna really likes using Schmincke Horadam watercolour and here she takes us through how she painted a mountain scene in the Austrian village of St Anton am Arlberg using Horadam paints. 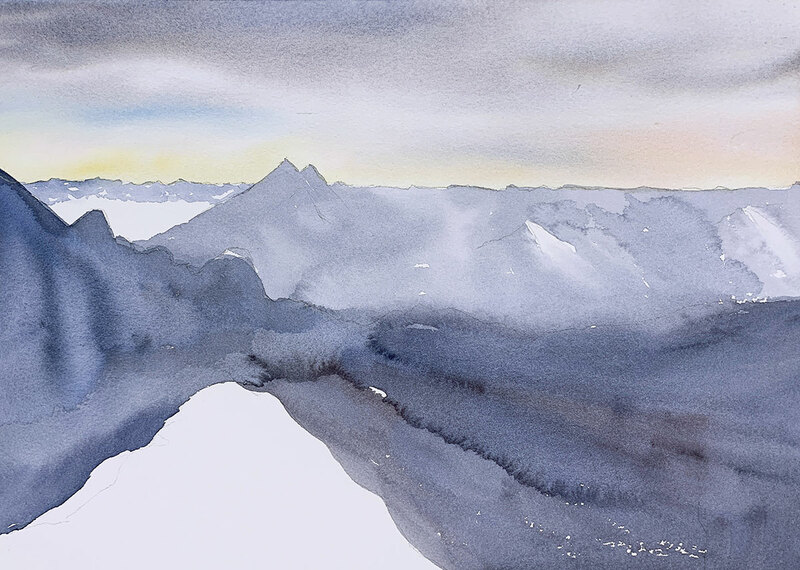 With this painting I wanted to quickly capture the unforgettable moment of the beginning of a sunset in the mountains. The sky is coloured in yellow and rose shades and all the peaks show their power and beauty before plunging into darkness. My first step is the preparation. I apply masking tape on all four edges of my paper and place all the materials, brushes, clean water and towels nearby. 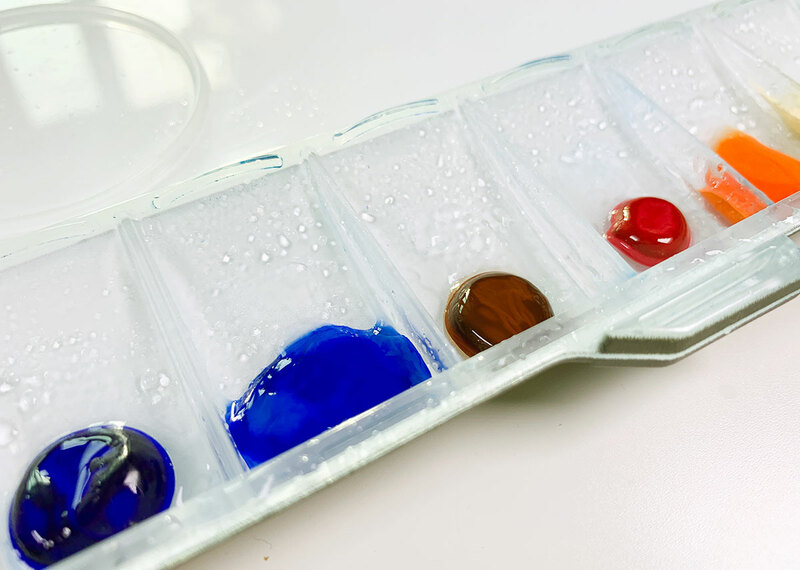 I then splash my watercolours with clean water so they will be soft and ready for painting. I begin with a basic pencil sketch onto the watercolour paper. It is not very detailed – just the edges of the peaks are enough. I begin the painting with the sky. I carefully wet the paper in the sky area with clean water and apply the watercolour. The violet-grey colour of the sky is made with cobalt blue hue mixed with cadmium orange, the bottom part of the sunset – with Naples yellow and rose madder, the splashes of blue sky in the centre – with phthalo sapphire blue. To make it more realistic I add a drop of rose madder to the upper part in the grey wash. After finishing the wash I let the paper dry. Sometimes I speed the drying with a hair dryer, other times I let it dry naturally by waiting. 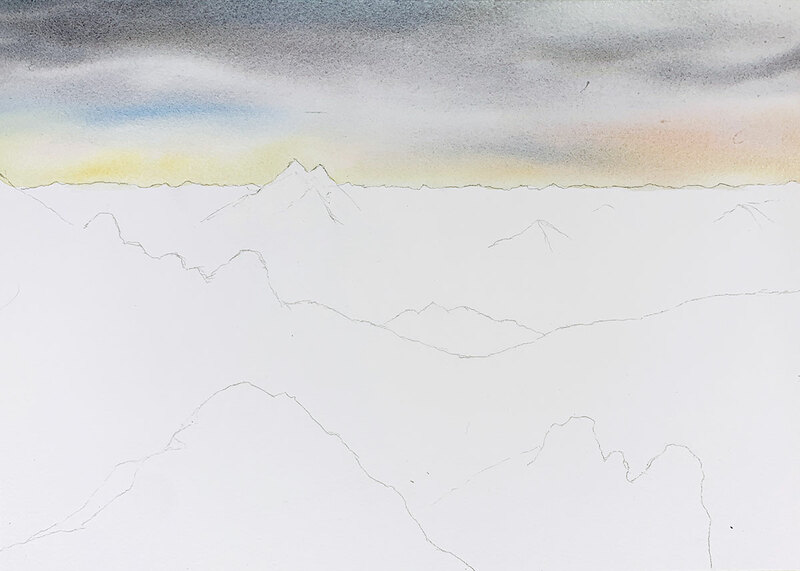 When I start again I work with the base colour of the snow – I’ve chosen a mix of ultramarine and cadmium red orange for the distant mountains. Approaching to the nearest mountain, I use the previous mix of ultramarine and cadmium red orange with a little cobalt blue and rose madder. The closest peak, covered with snow, I have left as just white paper. 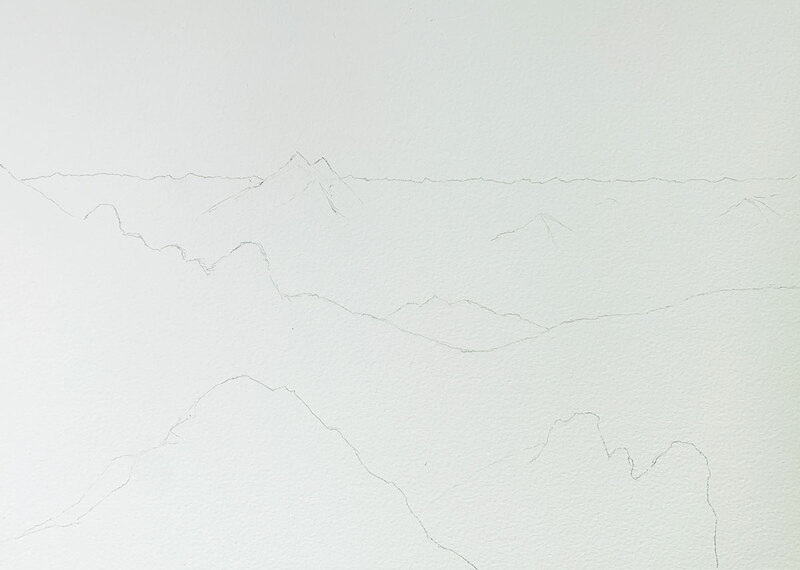 I next begin painting the rocks and shadows on the distant mountains. For these rocks the colour is a mix of ultramarine and indigo. 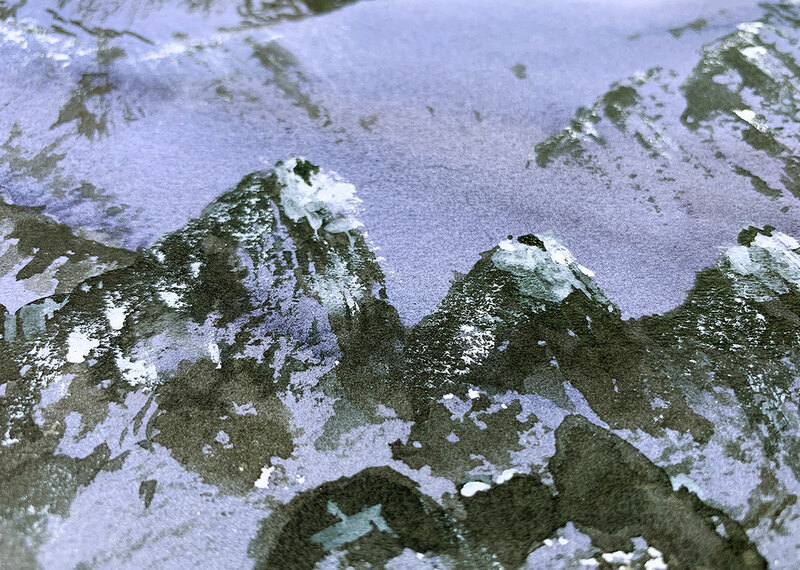 I also use the same colour for just a few dots on the tops of the far mountains to create the feeling of shadows. For this part I also use the dry-brush technique. Next I move to the stones in the closer mountain range. The technique is the same, the colours here are a mix of indigo and sepia. And again, I used this technique with the closest peaks and stones, the colour here is pure sepia. Next, I work with the closest peak that is covered with snow. 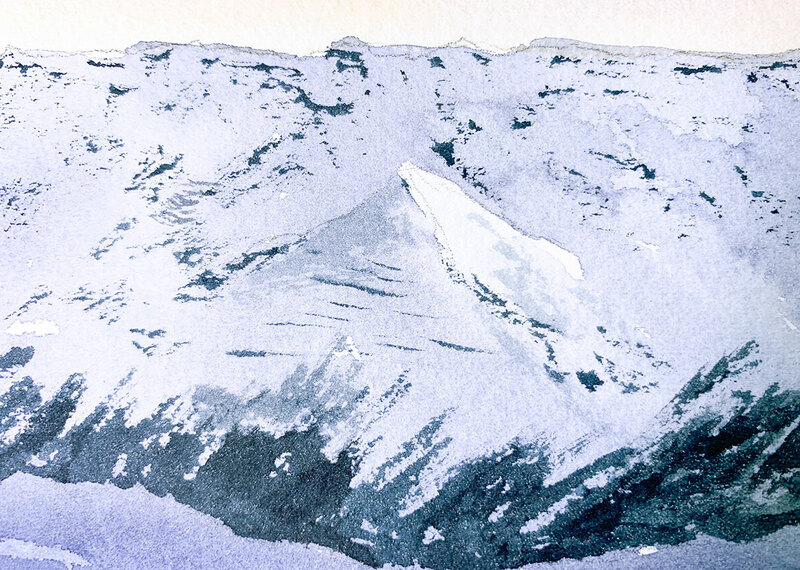 I want the snow to be just white paper, so it’s critically important not to cover it with any colour – so I just paint a little shadow on the snow in the left edge with a mix of ultramarine and cadmium red orange. The big rocks are painted with a mix of sepia and transparent brown. After I paint this, I cover all of the work except this white area with spare sheets of paper and spatter the watercolour with the same colour. 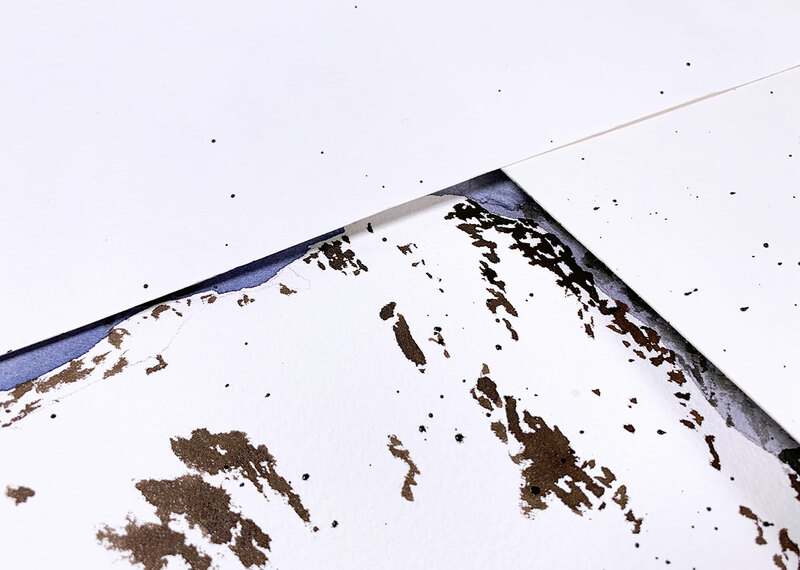 I then let it dry naturally – if you use a hair dryer on this step, the dots of paint can crawl away. Finally I look at the painting and compare it to the reference photo and take note of any areas I want to modify. I’ve added some more dark spots and used opaque white in some places to create a more interesting image. 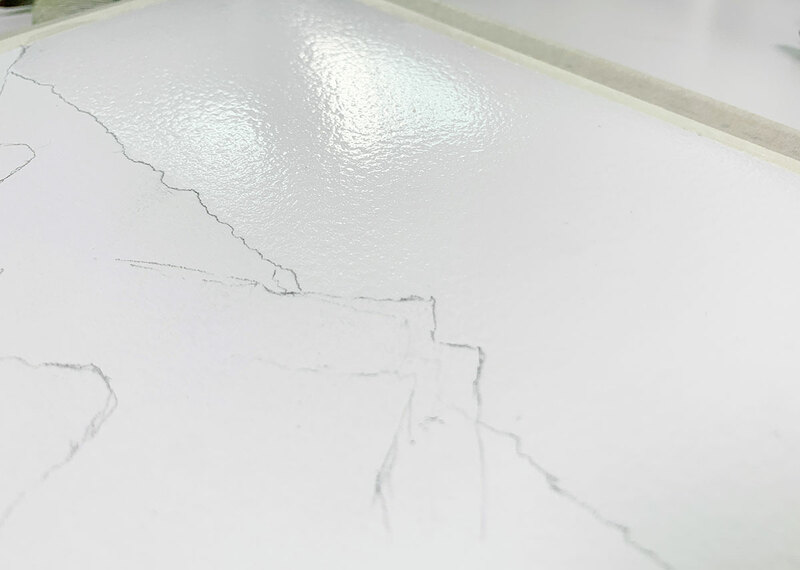 The finished painting after removing the masking tape – voila! Anna Zadorozhnaya was born and lives in Moscow, Russia. Anna has an MA in Art from Oxford Brookes University and is a member of the International Federation of Aquarellists. She shares her watercolour paintings on her popular Instagram site www.instagram.com/draw_better. Schmincke Horadam watercolours are available as single colours and in sets.